Many parents of children with Down syndrome are concerned about literacy. The process of being able to read, comprehend, and write. We've been lucky. Alice loves reading and being read to. It's something we do often and encourage. Most weekends, I take her with me to do the week's shopping and have her help put things in the cart. This week, I tried an experiment. 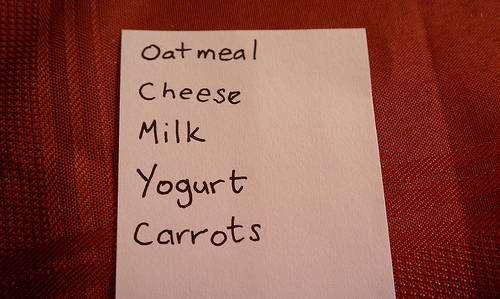 I made Alice her own personal shopping list to take with her. When we started, she read each item on the list and I made sure that she knew what they all were. She held the list and picked out each item (or pointed them out if she couldn't reach) and put them in the cart, then crossed them off the list. It worked wonderfully. She loved the job and the independence. The items weren't in the order that we go through the store. She did a great job keeping track of everything.